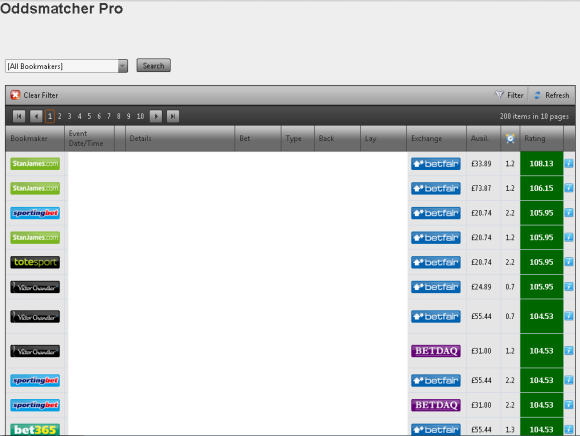 19 Comments on "Introducing Oddsmatcher Pro"
Hi where is the link to the free site?? interesting the new oddschecker But all the odds only ever seem to comer out that you just break even .How do you use it to make arbitage profits ,Please give me an example of making a good small profit on the oddsmatcher. 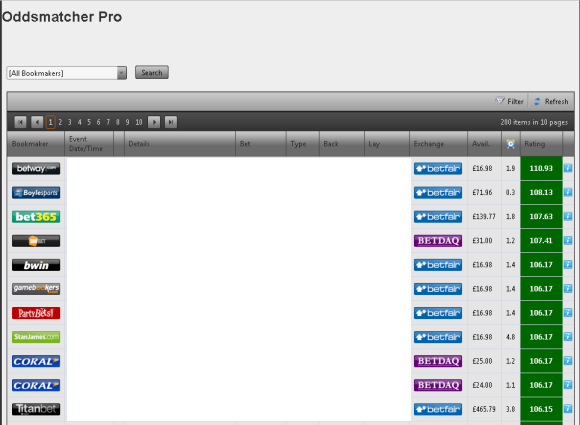 Primarily this is a tool for matching up odds for free bet offers or to find free / cheap insurance for trading. The arbs it finds are really a bonus but surprising how many the Pro version does pick up. The price is still £10 for a whole months access at present. We are also setting up options to find free / cheap insurance for trading and risk free profits from others too to be honest the arbs are a bonus as price matching is what this tool is all about. 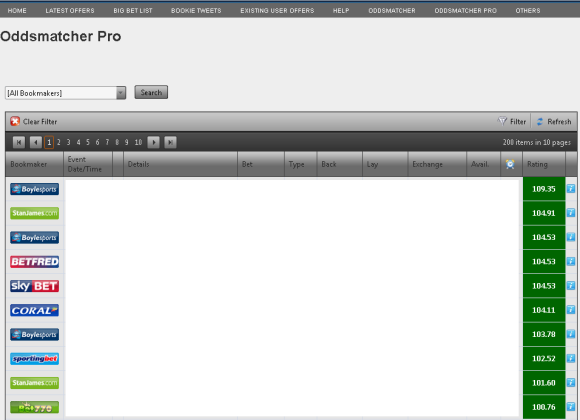 Last year the free calculator was available….is this totally gone? 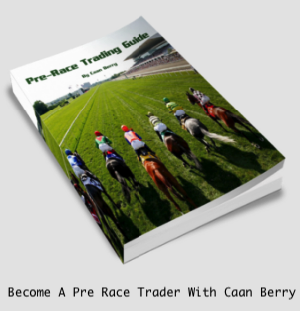 hi, does it only include betfair and betdaq exchanges? I can’t find vernons in the original version, does the pro version have extra bookies like vernons? You say that this is primarily for odds matching to make the best of the free bets, but your odds on many of the bets are below those allowed by those bookmakers, so they are completely useless. For instance, SkyBet requires minimum odds of 2.00, but the highest return bets you list are all well below these odds so cannot be made use of. Have you not considered filtering those redundant bets out. 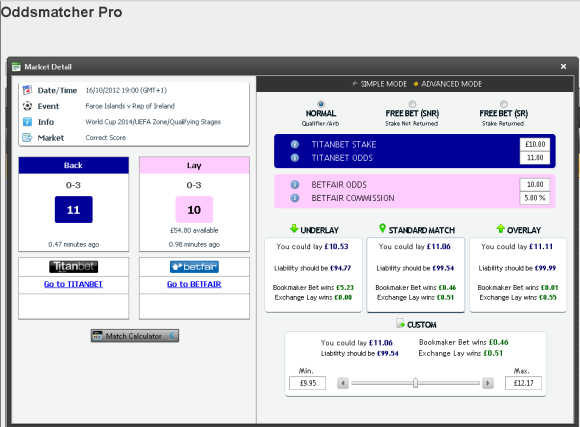 We do already have filtering options for both the BACK and LAY odds. 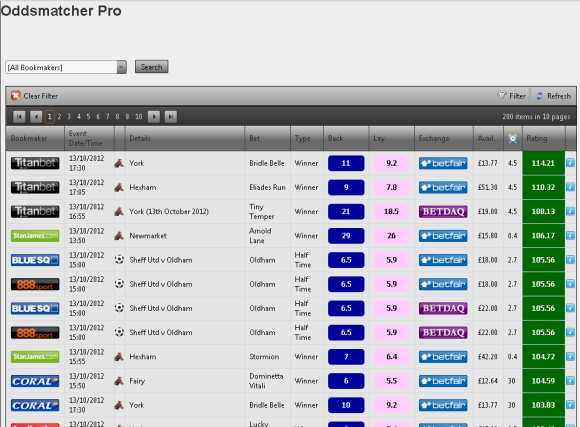 For example SKYBET at 2.00 and above just select like this…..
where is the calculator please? Is the monthly fee for a fixed period or can you cancel your subscription at anytime? £10 a month. No contract or min term so can cancel whenever you like. No problem Shaun. Thanks for the question. For example we can use the various “Bore Draw” (0-0) refund offers. Just back and lay within the terms of the particular offer, usually restricted to certain markets and you will then have some risk free insurance should a match end 0-0 which then gives you a nice buffer when trading. The key comes from finding the value in any offer in question i.e. is the offer a better value return than just backing 0-0 in the first place. Sometimes yes, sometimes no but always worth a look.